2 Max temperature Up to 400-degrees F.
The Denmark® ceramic cookware is PFOA (perfluorooctanoic acid), PTFE (polytetrafluoroethylene) and cadmium-free for your health manufactured by TTU® (Table Top Units) since 1983 in California. The 10-piece set was created for a family’s loving of low-fat cooking that is delicious and wholesome. 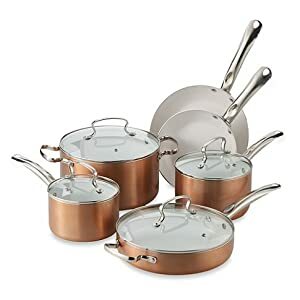 The set will give you a 2- and 3-quart saucepan with lids for each, a 3-quart sauté pan with lid, a 6-quart Dutch oven with lid, and an 8- and 10-inch frying pan without lids. The cookware reaches temperatures quickly and delivers even heat on the bottom and sides with no hot spots. The aluminum cookware is super for searing, sautéing, frying, baking, braising, and simmering. The ceramic coating is safe for everyone, including pets, and the environment. The aluminum construction will give you fast and even cooking every time. The set is scratch and break resistant, and does not stick. The lids are made of tempered glass with handles on top to easily grip. You can use it on all stovetops including induction, gas, electric, and glass tops, and the set can be put in the oven up to 400-degrees F. The stainless steel handles will stay cool and are double riveted for security in gripping and moving. The white non-stick ceramic interior is complemented with a tan-copperish outside. It is also available in teal blue with white interior. Use butter or oils to coat the inside when cooking and use only wood, nylon, bamboo, or plastic utensils. Never use metal because they will scratch the ceramic coating. Only wash by hand and do not put in the dishwasher. Use dish detergent and warm water, rinse, and towel dry to look brand new again. A User’s Guide is included and the manufacturer wants you to be completely satisfied. If for any reason you are not satisfied with your purchase, you may return it for a replacement or refund of the purchase price. All return requests must be submitted within 30 days from the date of purchase. Shipping is non-refundable. Denmark ceramic cookware is the best, by far, cookware I have ever owned. I use them all the time and they still look like new with very little effort. The price is very reasonable compared to other cookware that cannot compare to this set! You can’t go wrong with this set of cookware! Denmark® is absolutely fabulous! Thanks for letting me and our readers know that! If it is made in California why does the label include the country of origin CHINA? You are misinformed. The label says “country of origin, China” because that is where they are made and where almost everything is made these days. We in the USA don’t like it, so tell President Trump to fix it. The Denmark® cookware is made by Tabletops Unlimited headquartered in California. However, the products are manufactured in various countries overseas including China. They are not made in Denmark either. Now you know the correct place made.